Daisetz Teitaro Suzuki (October 181870, Kanazawa, Japan — July 22, 1966; standard transliteration: Suzuki Daisetsu, 鈴木大拙) was a famous author of books and essays on Buddhism and Zen that were instrumental in spreading interest in Zen to the West. 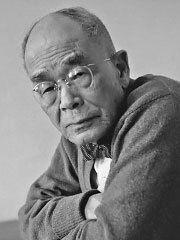 D. T. Suzuki was born as Teitarō Suzuki in Honda-machi, Kanazawa, Ishikawa Prefecture, the fourth son of physician Ryojun Suzuki. (He later changed his given name on becoming a Zen monk.) Although his birthplace no longer exists, a monument marks its location. The Samurai class into which Suzuki was born into, declined with the fall of feudalism, which forced Suzuki’s mother to raise him in impoverished circumstances after his father died. When he became old enough to reflect on his fate in being born into this situation, he began to look for answers in various forms of religion. His naturally sharp and philosophical intellect found difficulty in accepting some of the cosmologies to which he was exposed. His brother, a lawyer, financed his life and education in Tokyo at Waseda University. During this time (1891), he also entered spiritual studies at Engaku-ji in Kamakura initially under Kosen Roshi; then, after Kosen’s death, with Soyen Shaku. Soyen was an exceptional Zen monk. In his youth, Kosen and others recognized him to be naturally advantaged. Three years after he had received «Dharma transmission» from Kosen at age 25, Soyen took the unique step of traveling to Ceylon to study Pali and Theravada Buddhism and live the alien life of the bhikkhu for three years. Under Soyen Shaku, Suzuki’s studies were essentially internal and non-verbal, including long periods of sitting meditation (zazen). The task involved what Suzuki described as four years of mental, physical, moral, and intellectual struggle. During training periods at Engaku-ji, Suzuki lived a monk’s life. He described this life and his own experience at Kamakura in his book The Training of the Zen Buddhist Monk. Suzuki was invited by Soyen Shaku to visit the United States in the 1890s. Suzuki acted as English-language translator for a book written by him (1906). Though Suzuki had by this point translated some ancient Asian texts into English, his role in translating and ghost-writing aspects of this book was more the beginning of Suzuki’s career as a writer in English. While he was young, Suzuki had set about acquiring knowledge of Chinese, Sanskrit, Pali, and several European languages. Soyen Shaku was one of the invited speakers at the World Parliament of Religions held in Chicago in 1893. When a German scholar who had set up residence in Illinois, Dr. Paul Carus, approached Soyen Shaku to request his help in translating and preparing Oriental spiritual literature for publication in the West, the latter instead recommended his disciple Suzuki for the job. Suzuki lived at Dr. Carus’s home and worked with him, initially in translating the classic Tao Te Ching from ancient Chinese. In Illinois, Suzuki began his early work Outlines of Mahayana Buddhism. Carus himself had written a book offering an insight into, and overview of, Buddhism, titled The Gospel of Buddha. Soyen Shaku wrote an introduction for it, and Suzuki translated the book into Japanese. At this time, around the turn of the century, quite a number of Westerners and Asians (Carus, Soyen, and Suzuki included) were involved in the worldwide Buddhist revival that had begun slowly in the 1880s. Besides living in the United States, Suzuki traveled through Europe before taking up a professorship back in Japan. Suzuki married Beatrice Erskine Lane, a Theosophist and Radcliffe graduate, in 1911. Dedicating themselves to spreading an understanding of Mahayana Buddhism, they lived in a cottage on the Engaku-ji grounds until 1919, then moved to Kyoto, where Suzuki began professorship at Otani University in 1921. While he was in Kyoto, he visted Dr. Hoseki Shinichi Hisamatsu, a famous Zen Buddhist scholar, and discussed Zen Buddhism together at Shunkoin temple in the Myoshinji temple complex. In the same year he joined Otani University, he and his wife, Beatrice, founded the Eastern Buddhist Society; the Society is focused on Mahayana Buddhism and offers lectures and seminars, and publishes a scholarly journal, The Eastern Buddhist. Suzuki maintained connections in the West and, for instance, delivered a paper at the World Congress of Faiths in 1936, at the University of London (he was an exchange professor during this year). Besides teaching about Zen practice and the history of Zen (or Ch’an) Buddhism, Suzuki was an expert scholar on the related philosophy called, in Japanese, Kegon – which he thought of as the intellectual explication of Zen experience. Still a professor of Buddhist philosophy in the middle decades of the twentieth century, Suzuki wrote some of the most celebrated introductions and overall examinations of Buddhism, and particularly of its Chinese Chan school (though he usually referred to this sect by the term «Zen,» which is the Japanese pronunciation of its name). He went on a lecture tour of American universities in 1951, and taught at Columbia University from 1952-57. Suzuki was especially interested in the formative centuries of this Buddhist tradition, in China. A lot of Suzuki’s writings in English concern themselves with translations and discussions of bits of the Chan texts the Biyan Lu (Blue Cliff Record) and the Wumenguan (Gateless Passage), which record the teaching styles and words of the classical Chinese masters. He was also interested in how this tradition, once imported into Japan, had influenced Japanese character and history, and wrote about it in English in Zen and Japanese Culture. Suzuki’s reputation was secured in England prior to the U.S. In addition to his popularly oriented works, Suzuki wrote a translation of the Lankavatara Sutra and a commentary on its Sanskrit terminology. Later in his life he was a visiting professor at Columbia University. He looked in on the efforts of Saburo Hasegawa, Judith Tyberg, Alan Watts and the others who worked in the California Academy of Asian Studies (now known as the California Institute of Integral Studies), in San Francisco in the 1950s. Suzuki is often linked to the Kyoto School of philosophy, but he is not considered one of its official members. Suzuki took an interest in other traditions besides Zen. His book Zen and Japanese Buddhism delved into the history and scope of interest of all the major Japanese Buddhist sects. He also wrote a small volume about Shin Buddhism. And he took an interest in Christian mysticism and some of the noted off-beat mystics of the West. D.T. Suzuki’s books have been widely read and commented on by many important figures. A notable example is An Introduction to Zen Buddhism, which includes a thirty page commentary by famous psychoanalyst Carl Jung. Other works include Essays in Zen Buddhism (three volumes), Studies in Zen Buddhism, and Manual of Zen Buddhism. Additionally, Willam Barrett has compiled many of Suzuki’s articles and essays concerning Zen into a volume entitled Studies in Zen. Suzuki’s Zen master, Soyen Shaku, who also wrote a book published in the United States (English translation by Suzuki), had emphasized the Mahayana Buddhist outlook of the Zen tradition. Contrasting with this, to a degree, was Suzuki’s own view that in its centuries of development in China, Zen (or Ch’an) had absorbed much from indigenous Chinese Taoism. Suzuki believed that the Far-Eastern peoples had a sensitivity or attunement to nature that was acute, by comparison with either the people of Europe or the people of Northern India, generally speaking. Suzuki subscribed to the idea that religions are each a sort of organism, an organism that is (through time) subject to «irritation» — hence, showing the capacity to change or evolve. It was Suzuki’s contention that a Zen satori (awakening) was the goal of the tradition’s training, but that what distinguished the tradition as it developed through the centuries in China was a way of life radically different from that of Indian Buddhists. In India, the tradition of the mendicant (holy beggar, bhikku in Pali) prevailed but, in China, social circumstances led to the development of a temple and training-center system in which the abbot and the monks all performed mundane tasks. These included food gardening or farming, carpentry, architecture, housekeeping, administration (or community direction), and the practice of folk medicine. Consequently, the enlightenment sought in Zen had to stand up well to the demands and potential frustrations of everyday life. D. T. Suzuki received numerous honors, including Japan’s national Cultural Medal. Despite Suzuki’s pioneering efforts, today he is sometimes considered a marginal figure, who was neither a formal Zen monk nor a serious historian. This may be a somewhat harsh view, since some clearly credible Western scholars, such as Heinrich Dumoulin, have acknowledged some degree of debt to Suzuki’s published work. Nevertheless, Suzuki’s view of Zen Buddhism, today judged to be an idealized portrayal, as well as his ambivalent position toward Japanese imperialism in the interwar years, have both come under much scrutiny. These essays were influential when they came out, making Zen more widely known in the West. Essays in Zen Buddhism: First Series, New York: Grove Press. Essays in Zen Buddhism: Second Series, New York: Samuel Wieser, Inc. 1953-1971. Edited by Christmas Humphreys. Essays in Zen Buddhism: Third Series, York Beach, Maine: Samuel Weiser, Inc, 1953. Edited by Christmas Humphreys. An Introduction to Zen Buddhism, Kyoto: Eastern Buddhism Soc. 1934. An introductory volume roughly covering the same material as Essays: First Series. The Zen Doctrine of No-Mind, York Beach, Maine: Red Wheel/Weiser, 1972, ISBN 0877281823. Manual of Zen Buddhism, New York: Grove Press, 1960. A collection of Buddhist texts, images,including the «ten ox-herding pictures». translation of Lankavatara Sutra from the Sanskrit. Boulder, CO: Prajña Press, 1978, ISBN 0877737029, first published Routledge Kegan Paul, 1932. Mysticism: Christian and Buddhist: The Eastern and Western Way, Macmillan, 1957. «A study of the qualities Meister Eckhart shares with Zen and Shin Buddhism».